Will increasingly expensive labor automatically give the plant lowering system the last push? It is an inventive solution to an ever-growing problem: the availability and cost of labor. 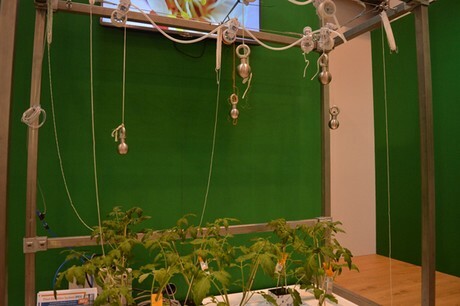 Not surprisingly, therefore, the Plant Elevation System, an automatic system for lowering the crop, once again drew a lot of attention this year at the IPM. 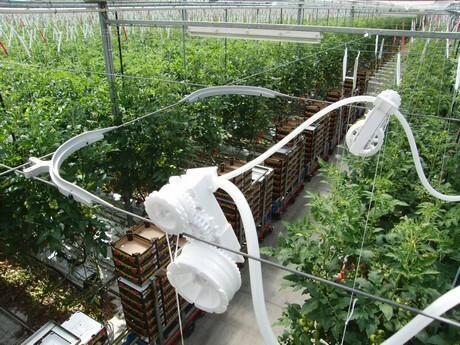 Nevertheless, growers hesitate to hang the system in volume in their greenhouses. Mat Versleijen from Mertens, which markets the system of producer Atgrow, has often been asked the question 'what does it cost?' "I like to compare it with the introduction of suspended gutters. Growers also doubted the cost of that system, but now no greenhouse can do without it." The operation of the system is reminiscent of the ticking of a clock. A compressor with one bar pumps air pressure into a transparent ring line. That ring line runs through plastic pulleys that are hung on the existing high wire. Two pump movements put the pulley into operation so that the wire sinks one centimeter and the crop moves one centimeter at a time. All this is computer-controlled with the help of a control box that allows the grower to adjust precisely when the crop lowers and shifts. "Lowering systems already exist, but this system makes it possible to both lower and shift the crop," Mat explains. "For growers it reduces labor by ninety percent, but also the crop benefits. The plant now is lowered much more evenly than when a crop hook is turned in one go. Also, the lowering can now take place at night, when the plant digests stress better than for example in the middle of a hot summer day. Finally, it is now easily possible to lower the crop to the desired harvest height."